In 1641, some fifty French settlers, both men and women, recruited in France by Jérôme Le Royer de la Dauversière, of Anjou, on behalf of the Société de Notre-Dame de Montréal, set sail for New France. They hoped to convert the Natives and create a model Catholic community. The first mass celebrated in Montréal, in May 1642. 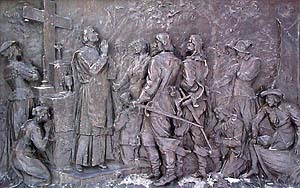 Bronze low relief by Louis-Philippe Hébert. Detail of the monument to Paul de Chomedey, sieur de Maisonneuve (1895), Place d'Armes. After a long crossing and a number of stops, the small group, led by Paul de Chomedey de Maisonneuve, of Champagne, with the energetic assistance of Jeanne Mance, landed on the point of land next to the little river on May 17, 1642, and there founded Ville-Marie. The little colony would soon become known as Montréal. Armed with the faith of pioneers, the new arrivals set to work to build the Ville-Marie fort on the spot where Champlain had once stayed. Over the years, Amerindians bringing furs in their canoes down from the Great Lakes watched as a small French town grew up on the gentle slopes of the ridge, around the Hôtel-Dieu hospital founded by Jeanne Mance. But repeated wars with the Iroquois made life difficult for the first Montrealers, and the dream of a missionary settlement gradually evaporated. The streets of Ville-Marie in 1685. 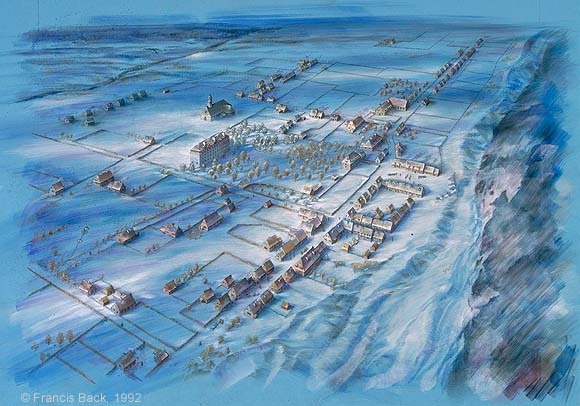 By 1685, Ville-Marie was home to some 600 colonists, most of them living in modest wooden houses. The parish church and the seminary of the Sulpician fathers, seigneurs of the Island, dominated the little town. Most business was transacted in the Marketplace, located just next to the mouth of the little river. Here Montrealers and Amerindians would meet to trade. Many traces of Old Montréal from those days still remain: the layout of the streets, blocks and lots, many artifacts and objects, archives, and even a building dating from 1685, the Sulpician Seminary. The city fathers arrived, reconnoitred the surroundings and erected temporary structures. Fort Ville-Marie was built; first attack by the Iroquois. First land concession, to the Pierre Gadois and Louise Mauger household. 1653 Some one hundred new recruits arrived, including Marguerite Bourgeoys, the town's first teacher, who would found a community of teachers. 1663 Seigniorial rights to the Island were transferred by the Société de Notre-Dame de Montréal to the Sulpician Seminary. 1672 François Dollier de Casson, Superior of the Seminary, oversaw work to determine the layout of the town, rerouting some streets and planning new ones. 1679 Montrealer Daniel Greysolon Du Luth reached the tip of Lake Superior. 1682 Montrealer René-Robert Cavelier de Lasalle travelled all the way to the mouth of the Mississippi.